BEACON: Auckland from the space station. 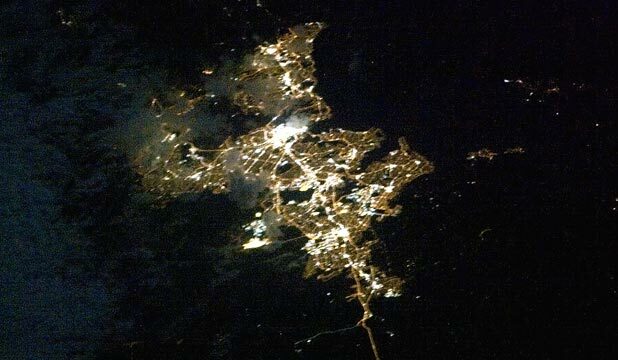 A Canadian astronaut on the International Space Station has photographed a bright Auckland at night – and tweeted it. “Holding a third of New Zealand’s population, it radiates like a beacon between the harbours,” International Space Station Commander Chris Hadfield said this morning. Yesterday he tweeted a picture of Christchurch just after Earth Hour ended on Saturday. The international effort involves cutting lights and electricity use between 8.30pm and 9.30pm in an effort to cut carbon emissions. Aboard the space station, Hadfield, who has made a speciality out of photographing the Earth, said on Twitter he was going to photograph the Earth Hour efforts. A little while later he said it turned out that orbital mechanics did not support seeing the lights out effort. But in one of his pictures he caught Christchurch just after Earth Hour ended. “The perfect grid system of the downtown core is clearly visible,” he says.